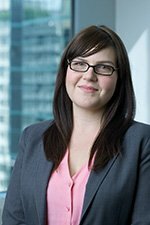 Melissa Ford is a junior Paralegal with the Firm's Patent Prosecution Team and has extensive knowledge of Canadian and foreign patent practice. She corresponds regularly with both foreign and Canadian clients and the Canadian Patent Office. Melissa is also involved with preparing and filing new Canadian National Phase and Direct filings, Declaration and Assignment submissions, payment of maintenance fees, prior art submissions, and voluntary amendments.